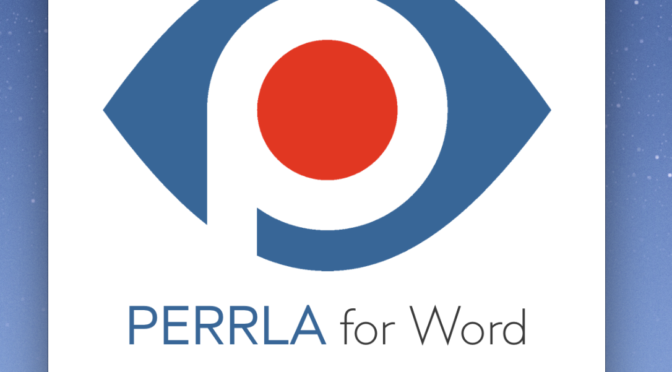 After many months of hard work, we are excited to introduce a completely rebuilt paper-writing solution for Macs: PERRLA for Word. We’ve not only put down completely new code, we’ve also redesigned the PERRLA paper writing experience to better fit with the needs of students today. Here are a few of the changes you’ll find this newest version of PERRLA. In today’s ever-more connected world, school has become a lot more than research papers and tests. Online discussions have become a central part of modern classrooms, and having to use APA or MLA in discussion posts hasn’t made them any easier. So, we’ve added the ability to create a brand new type of Paper with PERRLA for Word: Discussion Posts. A Discussion Post cuts out all of the extra fluff that’s included in Research Papers while leaving only what you need to write a perfectly formatted Discussion Post. That means you won’t have any title pages to cut out or page breaks to deal with. Discussion Posts include the body of your paper and a Reference section directly below it. You can even use “Copy for Web” at the bottom of the PERRLA window to copy your entire paper (body and Reference section) to your Clipboard with just one click. Writing formatted Discussion Posts for school has just gotten a lot easier! One of the limitations of Word 2016 was that we could no longer run PERRLA directly inside of Microsoft Word. However, now that PERRLA runs alongside Word, we are able to show you more information about your References, Citations, and Papers than ever before. PERRLA’s Writing Mode (what we call the side-by-side view of PERRLA and Word) allows us to provide you with an area to manage your Paper Sections (like the Title Page), the elements found in the Paper’s Body, your Paper’s References and Citations, and the technical details of your Paper. We’ve still got some great ideas in store to make this new layout even more powerful and streamlined with future updates, so we hope that although this is a new way of working with PERRLA, you’ll still feel right at home. One of the biggest improvements comes into view as you work with your References and Citations. And in PERRLA for Word, we’ve made full use of the new layout. Our Reference Wizard is no longer a series of small grey boxes that you have to click through. Instead, we’ve taken a note from PERRLA Online and included our streamlined Reference Wizard that lets you fill in all the details of your Reference in one place. When editing your References, you’ll also be avoiding a long series of windows as well. The References and Citations tab also lets you easily see all of the References and Citations that you currently have in your paper. You can also add and create References, create new Citations, edit your References and Citations, and delete them all in one place. To keep this post from going on forever, why don’t you just take a look at our new PERRLA for Word in action. Thanks for reading! Now, go write your best papers yet with PERRLA for Word! It’s been a few weeks since we let everyone know that we’re working on a new version of PERRLA for APA/MLA for Macs. Since then, we have been working on making sure that this new update will be the easiest solution for writing APA papers. That means that we’ve spent lots of time sketching new user interfaces, mapping out how students will use it, and brainstorming the most effective ways to wrangle even the toughest APA or MLA standards. As we mentioned in some of our previous posts, we can no longer run inside of Microsoft Word 2016 for Mac as an Add-In (running in the Microsoft toolbars). Instead, we are creating a more robust paper writing stand alone application that will give you greater control for creating, managing, and writing APA and MLA papers. One of the aspects of this that gets us really excited is the ability to create a custom environment for you to work with all of your References, Headings, Citations, etc. Now that we aren’t stuck with Microsoft’s strict UI standards, we can explore some powerful new interfaces that will make PERRLA easier and more powerful. We’re still in the early phases of this, but we are working on an adaptive interface that gives you the tools you need, right when you need them. That may sound incredibly cryptic, but we are already working on something more concrete for our next development update. We’re already excited about what’s coming, and we think it’s going to be the best version of PERRLA for APA/MLA yet! Mac Users… as you may know, Microsoft removed the ability for software like ours to run inside of Microsoft Word 2016 for Mac. At Apple’s insistence, Microsoft disabled third-party Word add-ins so that it could be sold in the Mac App Store. This only affected the Mac version of our software. PERRLA for APA/MLA for PC works perfectly with Word 2016 for Windows! Good News! 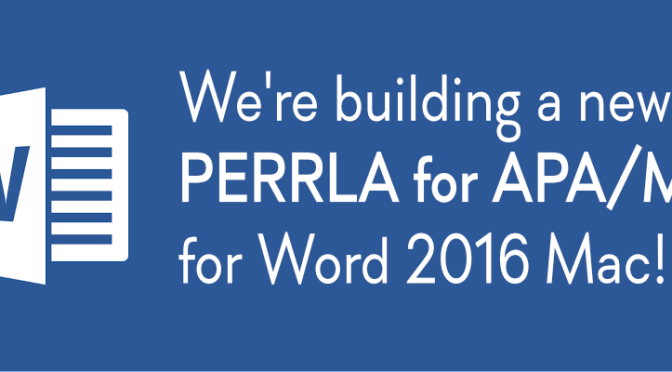 We are working on a completely new version of PERRLA for APA/MLA to work with Microsoft Word 2016 for Macs! This new version of PERRLA for APA/MLA for Mac will run in parallel with Microsoft Word (to avoid the security issues that caused the initial problem) but will still manage the citations and references inside your Word document, as always. We are working hard on this new version for Mac users and we expect to release it for this upcoming Fall semester. In the meantime, if you have to write papers before this Fall, we’ll happily upgrade your PERRLA for APA/MLA account to PERRLA Complete. With PERRLA Complete, you can write your papers online without having to use Word. Or, you can create the title page, abstract, outline, citations, references, etc. in PERRLA Complete and then export the data as a Word document so you can type the body of your paper in Microsoft Word 2016 for Mac. We’ll give you a project update this summer. Just know that this is important to us and we’re doing the right thing to get a great solution in your hands for Fall.